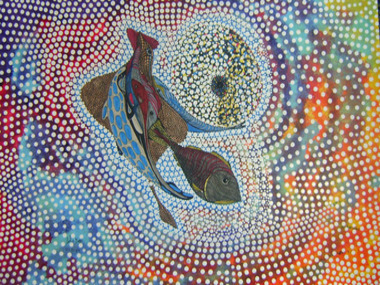 Previewed at the 2009 Cairns Art Fair in August - with works sourced for Collections. In the year of the 150 Celebrations of Queensland, the works by Queensland artist, Carl Moggs provide a wonderful opportunity to see the new talents emerging from Queensland. Carl P. Moggs, self taught artist and hunter from the Bigambul group uses a combination of inks, acrylics and oils to interpret stories from the Dreamtime that he heard from indigenous elders and his grandmother Ivy during his childhood. He combines traditional indigenous style work with a Norwegian (his father’s heritage) kind of psychedelia to produce a unique body of work that also reveals his own strong spiritual link to the land.